The world’s first virtual assessment clinic in the field of Lower Urinary Tract Symptoms (LUTS) has been launched. ELAROS 24/7 is an innovative new way of carrying out initial assessment as well as the long term management and monitoring of patients with LUTS. LUTS refers to a range of urinary problems that can significantly impair the quality of life for sufferers. Effective treatment requires clinical evidence on frequency of urine volumes passed and urgency, which is typically recorded using paper diaries. Use of such diaries is infrequent outside specialist services due to limited experience in primary care and the difficulty of interpreting the raw, variable data. A potential solution to these problems has been developed by ELAROS 24/7 Ltd (Electronic LUTS And Remote Observation Service). The system, ELAROS 24/7, was launched at a special event at the University of Sheffield’s conferencing facility, The Edge, which was attended by more than 100 clinicians, business people and key stakeholders. ELAROS 24/7 Ltd is a partnership between Devices for Dignity (D4D)/Sheffield Teaching Hospital Foundation Trust, MDTi Healthcare Ltd, Medipex (NHS Innovation Hub for Yorkshire and Humber) and RTC North, with funding awarded through the Engineering and Physical Science Research Council (EPSRC). The ELAROS system consists of three parts – the UroDiary (to collect data), the UFlow meter (to measure flow rates) and the UroConnect (to manage and analyse data). Informed by NICE guidelines on the identification and management of LUTS, ELAROS 24/7 is used by the patient to record times, volumes passed, and the desire to urinate. Once recoded, data is downloaded to the GP’s computer system for data visualisation, interpretation and patient management. 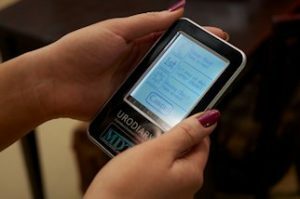 The UroDiary®, a portable electronic diary, is more discrete than writing in a diary, and makes data easily traceable and transferable between healthcare providers. Simple data capture, analysis and quicker diagnosis will potentially save the NHS £66M per year* through reduction in referrals to secondary care and diagnostic costs. Professor Chris Chapple, D4D’s Urinary Continence Management Theme Lead, said at the launch event: “A bladder diary is an essential tool for clinicians assessing lower urinary tract symptoms – but a paper diary is not practical and often not reliable. It is also predicted that the ELAROS service will make significant savings on pharmacology budgets of at least 10% on the drugs being used in this area of health, with a pilot being run in February 2013 to test these assumptions. 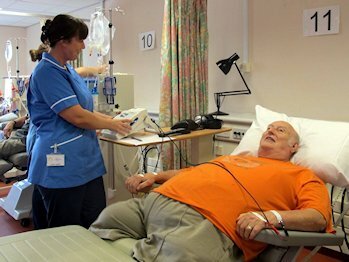 D4D team members from St. James’ Hospital, Leeds, have implemented a novel approach to body composition monitoring which allows many more patients to benefit from this objective assessment of haemodialysis patients’ fluid status. This helps ensure that the right amount of fluid is removed from the patient’s body during their treatment. D4D’s Renal Technology Theme works to facilitate the development and adoption of systems, devices and services to assist renal patients’ independence and help achieve better outcomes. One of the Theme’s key projects is the validation and implementation of body composition monitoring (BCM) which provides an objective assessment of haemodialysis patients’ fluid status. The models used for BCM were developed and validated for measurements between hand and foot, meaning that patients with lower limb amputations or heavily bandaged feet can be excluded from measurements. The team in Leeds performed a study which compared hydration measurements made from hand to hand to standard hand to foot measurements in 101 patients. Sufficient agreement was found between the readings to encourage the use of this approach in patients unsuitable for a standard measurement. Consequently, a number of patients in the care of the Renal Unit in Leeds, such as bilateral amputee Terry seen right, are benefitting from having their fluid removal routinely guided by hand to hand measurements. This work was recently presented at the annual conference of the European Dialysis and Transplant Nurses Association and European Renal Care Association in Strasbourg to great interest. The Bristol Urological Institute (BUI) BioMed has been part of a consortium working together on a £1.2 million project to find ways of reducing the impact of continence difficulties for older people. This interdisciplinary project, entitled ‘Tackling Ageing Continence through Theory, Tools and Technology’ (TACT3), was led by the Brunel Institute for Bioengineering (BIBS) and funded by a Research Council New Dynamics of Ageing programme grant. The project started in November 2008 and has recently been completed. The research was being carried out by teams at Brunel University, the Helen Hamlyn Centre for Design, the University of Manchester, the University of Sheffield, the University of the West of England and the BioMed at the BUI. A colour change odour detector to reassure pad users by alerting them to the smell of stale urine before it can be detected by the human nose. The odour detector had a 90% response rate when tested in vitro and responded within 2 minutes of exposure to stale urine. Continence pad users were asked for their opinion on the design of the device, with 90% believing it was a good idea and 80% that it would be easy to use. Smart underwear designed to detect a leak from a continence pad before the urine can spread to outer clothes or furniture. A clinical prototype was successfully developed and evaluated by continence pad users. Over 90% of participants who tested it thought the underwear would or might make them feel more confident and have a positive impact. Discussions with industry are in progress over the commercialisation of this product. D4D is pleased to announce it has launched a dedicated twitter feed, which can be found at twitter.com/devices4dignity or @Devices4Dignity. There are over 500 million twitter users worldwide and it is one of the most popular social sharing websites. Nicola Heron, D4D Programme Manager, said: “Twitter is a great new way for us to share news and information. A Devices for Dignity (D4D) supported product that provides postural support to physically disabled children on board aircraft was launched this month at an event at the Gatwick headquarters of the UK Civil Aviation Authority (CAA). TravelChair 2012, designed by the children’s disability charity MERU, is portable so can be securely installed on board the majority of types of aircraft (including helicopters) on request. D4D supported MERU with TravelChair by providing advice and funding for research. Virgin Atlantic has already placed orders for the TravelChair 2012 and MERU are actively participating in negotiations with several other major airlines. The launch event was attended by representatives from the travel industry, disability groups and major airlines, as well as two of MERU’s patrons, Lawrence Llewellyn Bowen and Richard Stilgoe. A collaborative project between D4D, MDTi, Medipex and RTC North has been awarded funding through the Engineering and Physical Science Research Council (EPRSC). The EPRSC funding has gone towards the trial of a bladder diary device being developed by ELAROS 24/7 Ltd (Electronic LUTS And Remote Observation Service). The EPRSC’s Knowledge Transfer Partnership (KTP) is Europe’s leading programme helping businesses to improve their competitiveness and productivity through the better use of knowledge, technology and skills that reside within the UK Knowledge Base. 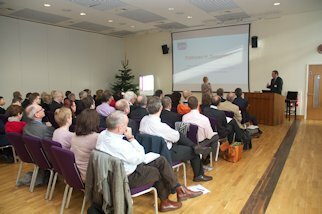 The EPSRC is building on a long-standing commitment to the KTP programme by providing funding for KTP as part of its investment in Knowledge Transfer Accounts (KTA). Lower Urinary Tract Symptoms (LUTS) can adversely affect the quality of life of many individuals, and represent a significant economic burden for the health and social services. Currently, national guidance (NICE) recommends the use of bladder diaries to record urinary events (i.e. frequency of voids, volume of voids and episodes of urgency). This aids accurate diagnosis and optimal management of LUTS. Despite this there is limited use of bladder diaries outside specialist services. There are two main obstacles to the use bladder diaries; the first is because of the limited experience with the use of a bladder dairy in primary care and the second relates to the difficulty in interpreting the raw information provided by a bladder diary. ELAROS 24/7 Ltd has developed an innovative, diagnostic tool providing a computerised assessment and management service for LUTS in both men and women. Data is collected by patients using a hand-held touch-screen electronic diary (UroDiary®) that is then downloaded to the GP clinical computer system for data visualisation, interpretation and patient management. Once established, this should reduce inappropriate referrals and improve the diagnosis and management of LUTS with the potential to save the NHS £66M in reduction in referrals to secondary care and diagnostic costs alone. Market launch is scheduled for December 2012. The KTP funding was received through the University of Sheffield’s Research and Innovation Department – University of Sheffield is one of the collaborative partners of D4D. Two companies collaborating with D4D have taken part in a major global business summit on Advances in Assistive Medical Technologies as part of the Paralympic programme. The global summit, which was organised by United Kingdom Trade and Investment (UKTI) and took place at British Business Embassy Lancaster House in early September, was attended by Tomorrow Options and Kingkraft. The summit, which took place during the Paralympic Games, focused on the impact of innovative approaches to rehabilitation and assistive technologies on the activities of people living with injuries, disabilities or illnesses. Paulo Ferreira dos Santos, from Tomorrow Options, a company that develops electronic devices for markets including health, sport and industry, delivered a presentation called ‘Advances in human biomechanics assessment’. Kingkraft displayed its Shower Chair project, which aims to develop an ultra-lightweight, mobile and compact collapsible shower chair (transportable by disabled people themselves) for the independent disabled person showering markets. The Summit was part of an 18-day programme taking place over the Olympic and Paralympic Games, with the Prime Minister, Deputy Prime Minister, Chancellor, Business Secretary, Foreign Secretary and over 30 other British ministers welcoming over 3,000 business leaders and global figures. The series of global business summits was the largest and most ambitious set of trade and investment events ever held in this country. Speakers included Professor Sir Bruce Keogh (KBE FRCS, Medical Director of the NHS), Mike Spindle (Trekinetic), Professor Guang-Zhong Yang (Imperial College) and Geoff McGrath (McLaren Applied Technologies). Devices for Dignity (D4D) is pleased to announce that it has entered partnerships with two national charities as part of its commitment to Patient and Public Involvement. The fundamental aim of D4D is to deliver technology solutions to support people with long term conditions – and crucial to this aim is the ability to communicate and engage with the end users of the technology. As part of our commitment to patient and public involvement, D4D has formed strategic partnerships with key charities operating in the same areas of healthcare in order to explore unmet clinical needs direct from the people who are best placed to identify them – patients and carers. These partnerships, with the Bladder and Bowel Foundation and Assist UK, have been formed to ensure user needs and views remain at the centre of D4D’s ongoing strategy. Robert Dixon, Chief Executive of Bladder & Bowel Foundation: “We look forward to the opportunity to work collaboratively with D4D in the future. We believe our ability to represent the views of bladder sufferers within the urinary continence work stream will add real value to both current and future projects. Alan Norton, Chief Executive of Assist UK, said: “As a member of the D4D Independent Steering Committee, I have advised D4D from both the perspective of CEO of Assist UK and as a disabled person myself.